When a card in the spread is reversed, it means that the energies of the card are blocked: it is a problem which calls for a solution. 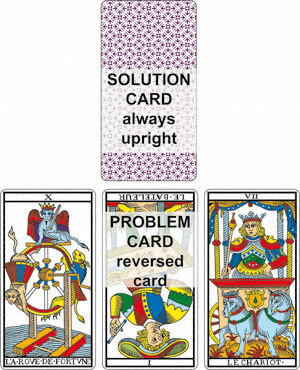 Therefore another card is drawn and laid directly above the Problem Card by way of solution. This "Solution Card" is always placed in upright position (by definition, a solution is not a problem!). This card indicates the direction to take, what needs to be done to clear the blockage of the "problem card": it is the card that heals the reversed card. The Regard of the figure in the Solution Card also needs to be taken into account. The Camoin Laws, the Camoin Codes, the Camoin 3x7 diagram, as well as the Philippe Camoin Reading Method have been protected by copyright since the years 1997 to 2000.